The Minister’s 5th December reply in the Belfast Telegraph to Mr McCartney’s letter shows her lamentable grasp of the issues. In the article she cites no evidence for her “model” of education, but simply offers her opinion. Two of the most highly regarded studies in the history of education research prove that she is wrong. The Revised Curriculum, together will “election” at 14 via a Pupil Profile will damage profoundly the life chances of the poor. The evidence is unequivocal that underachievement will dramatically increase if the Minister’s ideas are implemented. “Project Follow Through” is arguably the largest and most sophisticated educational project ever undertaken to discover, once and for all, the type of curriculum that maximizes the academic achievement of the poor. To give a sense of the scale of this study, it lasted 20 years, cost a billion dollars to fund, and involved 79,000 children from 180 low-income American communities living in poverty. The conclusion was that the curriculum which helps children out of poverty is a traditional curriculum in which the teacher determines what is to be taught and children work in learning environments which are orderly and highly structured. (The reader can find details of this study by “googling” the words Project Follow Through.) Curricula of the type the Minister is currently demanding that all primary school children follow were shown to be damaging to the development of the numeracy and literacy skills of disadvantaged children. A Minister who expresses concern for children being failed by Northern Ireland’s education system is promoting a curriculum that will increase that underachievement. The evidence that curricula of the Revised Curriculum type push the poor deeper into poverty is overwhelming. As with all her pronouncements to date, her romantic notions of how one enhances the academic attainment of vulnerable children are entirely at odds with the evidence. The Minister therefore needs a mechanism to impose an incoherent damaging education model on our children. That mechanism is the new Education and Skills Authority (ESA) to be headed by Gavin Boyd, the man whose Council for the Curriculum, Examinations and Assessment (CCEA) developed both the Revised Curriculum and the Pupil Profile. Mr Boyd’s approach to curriculum was tried out on the children of the Greater Shankill. The evaluation report concluded that in academic terms, the rich were getting richer and the poor poorer. Few parents in Northern Ireland are aware that Mr Boyd’s educational ideas have already been tried out and found wanting. Research carried out on behalf of CCEA demonstrated that the model of education he advocates is damaging to the life chances of the poor. The Shankill study replicates high quality international research on the impact of innovative curricula on the poor. The Shankill study (which refutes in every detail the case set out by the Minister in her reply to Mr McCartney) is rarely mentioned by the Minister, Mr Boyd, CCEA, the Department of Education, the Education and Library Boards or the media. The Minister’s support for ESA, with Mr Boyd at its head, will serve to entrench and deepen underachievement and is damaging to already vulnerable children. The really curious development is that the DUP have joined the Minister in endorsing Gavin Boyd’s ESA. Thanks to the DUP Mr Boyd’s contribution to the current mess we find ourselves in, is to be rewarded by assigning all aspects of our children’s education to his care. Rather than setting up an enquiry in which Mr Boyd might be asked to provide the evidence base for his ideas, Mr Boyd’s capacity to undermine a world-class education system is to be enhanced. The framework for such an enquiry already exists in the ten “features” of good policy-making developed for the Office of First Minister and Deputy First Minister. Mr Boyd should be asked to evaluate his history of education policy-making against each of the ten features. This sets the context for where we now find ourselves. This document aims to set out what the DUP must now do to protect standards of education in Northern Ireland in general, and lever up the basic skills of underprivileged children in particular. The DUP have highlighted their concerns for primary six children, and the plight of these children will be of particular concern in what follows. The DUP must insist that schools should be free to ignore the Revised Curriculum because of its pernicious effects on the achievement of poor children. DUP politicians should be aware that there is peer-reviewed evidence that the scientific basis for the Revised Curriculum is non-existent. Why should schools adopt a curriculum whose scientific basis has been refuted and which is damaging to the education of underprivileged children? It is a measure of the depth of the chaos into which we’ve descended that the Minister has threatened to use the law against primary schools who privilege traditional teaching and learning over the Revised Curriculum. Indeed, in this brave new world in which Sinn Fein seem ready to use the courts against law-abiding schoolteachers, curriculum documents on the assessment of cross-curricular skills begin not with a rationale for such skills, but with a statement of the legal requirements on the teacher. Under Ms Ruane the law is being invoked to deliver what educationalists call the “Matthew Effect” whereby the rich get ricer and the poor get poorer. This from the avowed champion of the poor and underachieving! It is important to reflect on the educational model which existed prior to the Revised Curriculum and to which schools could return if the Revised Curriculum were rejected. Mr Boyd’s own CCEA described the model which pre-dated the Revised Curriculum in these terms: “Education in Northern Ireland has an excellent reputation. In fact it’s no exaggeration to say that teachers here are regularly achieving results that are the envy of many other areas of the UK.” Who wouldn’t want to return to an education system described in these glowing terms? In addition, any move away from the Revised Curriculum is likely to free up much-needed finance for use elsewhere in education. (iii) preparing children for unregulated tests (whether the AQE achievement tests or NFER’s “intelligence” tests favoured by at least one Catholic grammar school). The most effective way in which the DUP can bring the misery of primary six children to an end is to take a clear stand on the Revised Curriculum, Pupil Profile and InCAS, leaving schools free to return to a model of education which focuses on maximising the literacy and numeracy skills of children, poor as well as rich. There can be no doubt that the DUP’s failure to take a firm stand in respect of the Revised Curriculum is contributing to the chaos in primary six classrooms. If the DUP were to highlight the fundamental shortcomings in the Revised Curriculum (of which InCAS is a part), primary six teachers could engage those who demand that they emphasise cross-curricular skills at the expense of literacy and numeracy, with much greater confidence. · require the designers of the Revised Curriculum to explain why they’ve pressed on with a discredited curriculum framework in the teeth of compelling evidence from the Greater Shankill study and Project Follow Through. SIR Jim Rose’s plans for the primary school curriculum have been billed as the most fundamental change since the national curriculum was introduced 20 years ago. That much is true. His most radical shift is away from subjects and towards a curriculum based on “areas of learning”. But three items of recent evidence suggest that the approach being adopted by Sir Jim – the Government’s top adviser on primary schools – is fundamentally wrong. First, last year’s national test results for 11 year-olds showed that almost 50,000 bright children failed to reach an acceptable standard in English and 30,000 failed to demonstrate a solid grasp of maths. Second, this year’s annual examiners’ report from exam board Excel pointed out that one in five teenagers believe that the Sun orbits the Earth. One in 10 did not know that a rechargeable battery could be used more than once. This came only a few days after the third shock: Psychology professor Michael Shayer, of King’s College, London, found that the high-level thinking skills of today’s 14-year-olds are now on a par with those of 12-year-olds in 1976. Prof Shayer blamed too much time spent on computers for this decline. Others have noted that today’s youngsters cannot distinguish properly between the real world and the virtual world of cyberspace. Sir Jim’s solution is increased use of computers in primary schools and less emphasis on a structured curriculum. But how can children make the best use of computers if they haven’t already grasped the basic foundations of English, including its grammar and literature, and maths and science? Sir Jim argues that the current curriculum is overcrowded. social and environmental understanding” and “physical health and wellbeing”. The theory is that children will learn essential knowledge – physical geography, for example, which gives us a sense of place, and chronological, fact-based history which gives us a sense of time – within six “areas of learning”. As a former school inspector, Sir Jim should know that once subjects become integrated, they lose much of their content, knowledge and structure, from which young people make sense of them – and learn to think logically. To be fair, these proposals only reinforce what is already happening in many schools, primary and secondary. The danger is that “progressive” ideology, which wants teachers of subjects to become social workers and pedlars of politically-correct values, will now be formalised and spread down through the system. Here is one example. Richmond upon Thames is not a local authority where anyone would normally look for “progressive” ideology. But Christ’s Church of England School, in Richmond, has almost abolished subjects for at least one year group. 11-16 comprehensive. Last year, 70 per cent of 16-year-olds achieved five or more grade A*-C GCSEs, though that drops to 53 per cent when English and maths are included. This is above the national average, but is certainly not impressive. Where the school does stand out is that it has introduced an integrated, theme-driven curriculum that emphasises skills, not subjects. Instead, the school teaches a Personalised Alternative Curriculum Experience (PACE). Pupils’ weekly timetables include 11 periods of Performing Arts (apparently a misprint as even the staff didn’t know what PACE stood for) and only three of maths and two of science. No identifiable geography, history or religious education at all. PACE, apparently, is based on the “Opening Minds” curriculum produced by the Royal Society of Arts (RSA). This is now being tested in more than 200 schools around the country. Meanwhile, the RSA, which is headed by Matthew Taylor, the former boss of Tony Blair’s No 10 Policy Unit, has opened a new academy in Tipton, West Midlands. The RSA Academy will not only follow the Opening Minds curriculum, it will also train teachers from other schools to do the same. As yet, no-one seems to have published any objective evidence to prove that PACE or Open Minds raise standards. It is claimed that pupils enjoy the lessons and they have the approval of Ofsted – but didn’t Haringey social services get a clean bill of health from Ofsted, too, before the Baby P tragedy came to light? Commenting about such changes to the national curriculum, Chris Woodhead, the former chief inspector of schools, wrote recently: “Academic standards? What a quaint, anachronistic ideal. “This is a curriculum alive with real world topicality. ‘Cross-curricular dimensions’ such as cultural diversity and sustainable development, are deemed to be more important than traditional subjects, such as history or science. “Indeed, in this curriculum, subjects have become vehicles for politically correct values… The idea seems to be that learning how to learn is more important than learning anything specific. Sir Jim’s proposals. Parents, surely, should be very afraid. The Northern Ireland Revised Curriculum has moved away from in-depth subject based teaching towards a skills based approach claimed to be suitable for the 21st century. However recent evidence shows that students today have only a superficial understanding of many areas. 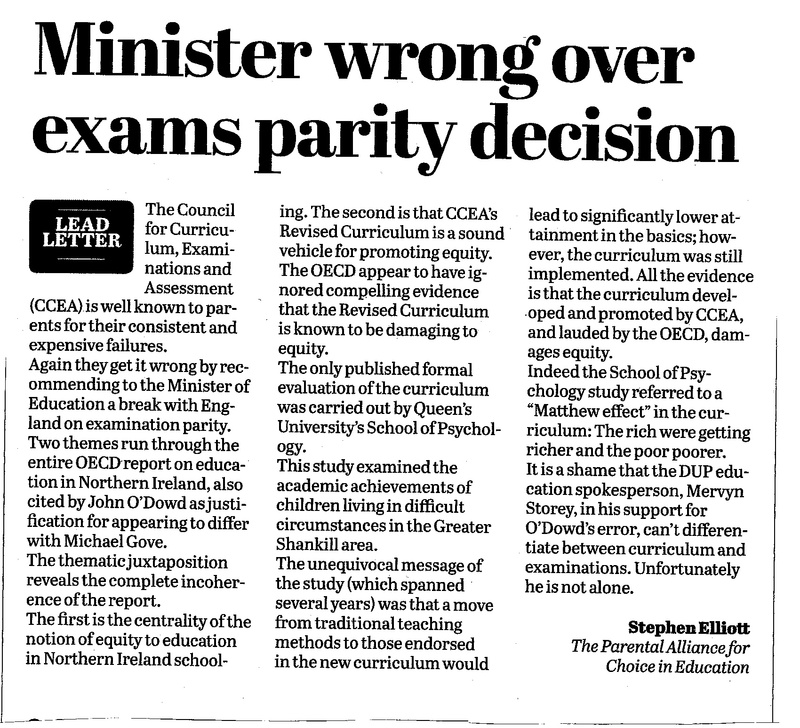 While the Northern Ireland Minister for Education, Caitriona Ruane and her band of spineless bureaucrats push on in the direction of imposed comprehensives the evidence from elsewhere shows the folly. See also Three Cheers for Selection. Both publications are downloadable at no cost.